On April 8, 2019, the Lower 48 demonstrated peak capacity figure in the first table was corrected to 4,263 Bcf. 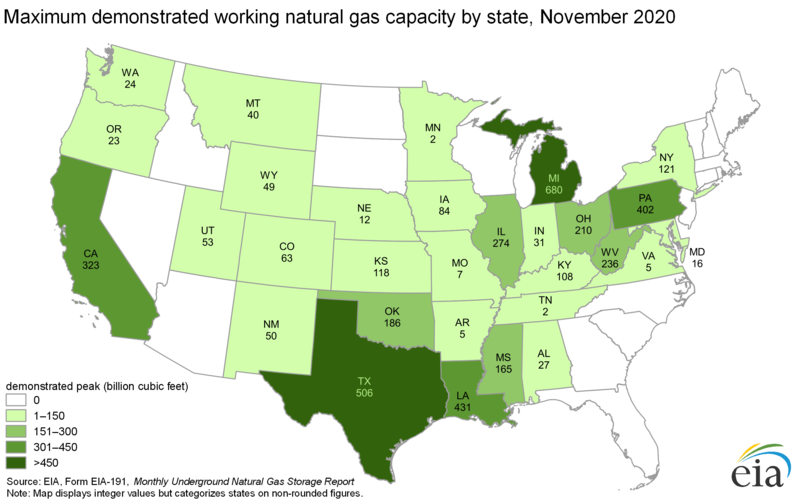 EIA’s two metrics for assessing underground working natural gas storage capacity in the Lower 48 states as well as in most U.S. regions have declined slightly in 2018 compared with 2017. 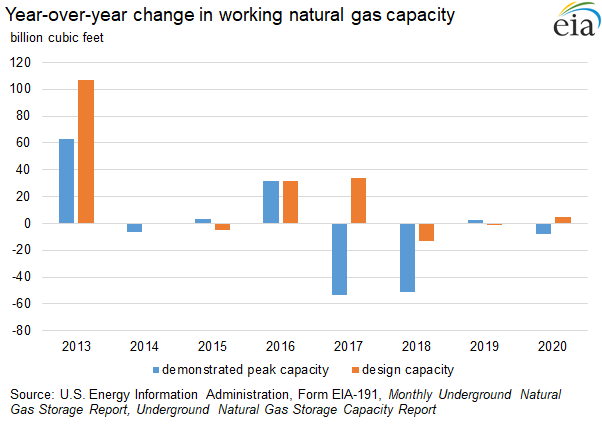 The two ways that EIA measures working natural gas storage capacity are design capacity and demonstrated peak capacity. Design capacity: Design capacity, sometimes referred to as nameplate capacity, is based on the physical characteristics of the reservoir, installed equipment, and operating procedures on the site, and often must be certified by federal or state regulators. 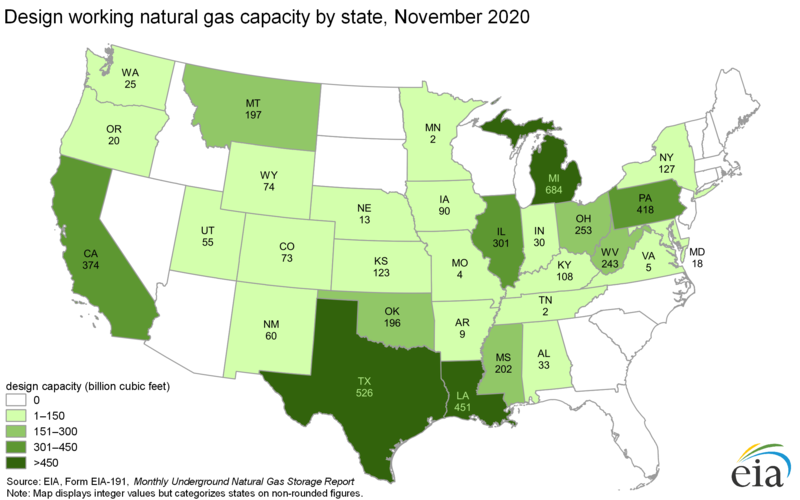 Design capacity is calculated as the sum of reported working natural gas capacities of the 380 active storage fields as reported on survey Form EIA-191, Monthly Underground Natural Gas Storage Report, as of November 2018. This metric is a theoretical limit on the total amount of natural gas that can be stored underground and withdrawn for use. Demonstrated peak capacity: Demonstrated peak capacity, or total demonstrated maximum working gas capacity, represents the sum of peak monthly working natural gas volumes observed, by field, during the most recent five-year period, regardless of when the individual peaks occurred. In this report, the most recent demonstrated peak looks at the months of December 2013 through November 2018. Demonstrated peak capacity is based on survey data from Form EIA-191 and is typically lower than design capacity because it relates to historical, actual facility usage, rather than potential use based on the design of the facility. Design capacity flat or down slightly in most regions. 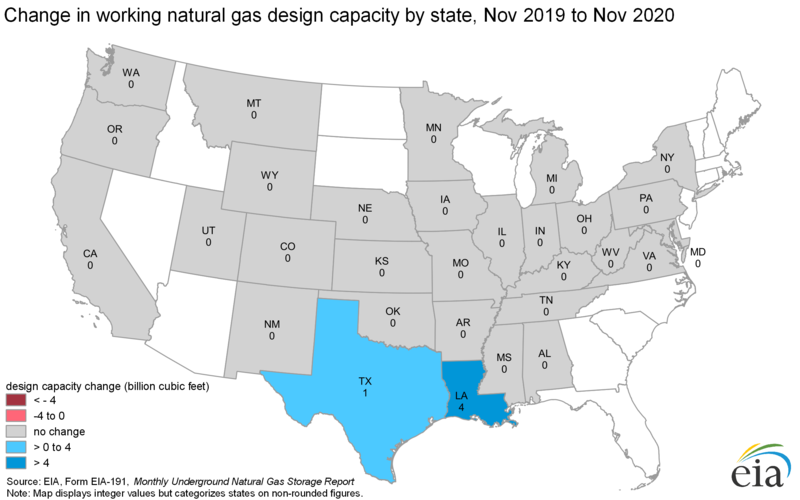 Design capacity of underground natural gas storage facilities was essentially flat, or decreased slightly in most storage regions in November 2018 compared with November 2017, with the exception of the Mountain region where it increased by 0.9%, or 4 billion cubic feet (Bcf). This increase in the Mountain region is the result of the East Cheyenne field reclassifying about 4 Bcf of base gas to working gas when it started reporting the West Peetz and Lewis Creek fields as one facility. The West Peetz/Lewis Creek facility was the only facility to expand by more than 1 Bcf design capacity during this report period. By contrast, design capacity in the South Central Salt region fell by 2.4%, or 12 Bcf. This decrease was mostly driven by capacity reductions at the Egan Storage Dome in Louisiana and the Tres Palacios facility in Texas. For the fifth consecutive year, no new facilities entered service in 2018. New facilities could have increased design capacity. Overall higher levels of natural gas production, compared with production a few years ago, reduced reliance on storage services for some customers to meet their natural gas needs. Production growth was driven by increased production in the Appalachian Basin, the Permian Basin, and the Haynesville shale formation. In recent years, the difference in the price of natural gas between the winter and summer has been structurally shrinking, decreasing from more than $0.50 per million British thermal units (MMBtu) within the last ten years to less than $0.20/MMBtu for much of 2018. This narrower difference has reduced the economic incentive to invest capital expenditures in increasing natural gas storage infrastructure. Midstream infrastructure buildout (such as pipelines and compressor stations) has enhanced grid interconnectedness and flexibility, allowing natural gas to more easily reach end-users, and consequently reducing dependence on injections and withdrawals from storage. The United States now exports significant and growing volumes of both liquefied natural gas and natural gas via pipeline to Mexico, that exhibit variability with respect to weather and price. The trend toward more natural gas-fired electricity generation continued in 2018. July 2018 holds the record for the most natural gas consumed in the U.S. electric power sector in a single month. Both electric sector natural gas consumption and total natural gas consumption reached their highest-ever annual levels in 2018. In the West Coast region, California faces ongoing issues related to infrastructure and storage limitations, as well as regulatory issues, largely as a result of the Aliso Canyon storage facility leak in late 2015. Low storage volumes in 2018: For the November 2018 report period (from December 2013 through November 2018), only one facility reported a new demonstrated peak in 2018 that was 1 Bcf or greater than the November 2017 report period (from December 2012 through November 2017). By contrast, 16 facilities reported demonstrated peaks in 2018 that were lower than in 2017 by 1 Bcf or more. This year’s report numbers reflect previous peaks—those occurring in 2013—falling off of the new five-year range, and show relatively few new peaks occurring in 2018, largely because of low storage levels across most facilities throughout the year. Storage stocks began the 2018 injection season on March 31 at a relatively low level, 1,360 Bcf, and they replenished inventories at a lower-than-normal rate during the injection season, in part, because of record-high power demand during the summer. As a result, total U.S. storage stocks for the end of November 2018 reached only 2,992 Bcf—lower than any year since 2002. High storage stocks have the potential to increase the demonstrated peak capacity for a given report period because more storage facilities are better positioned to fill to near their design capacities. 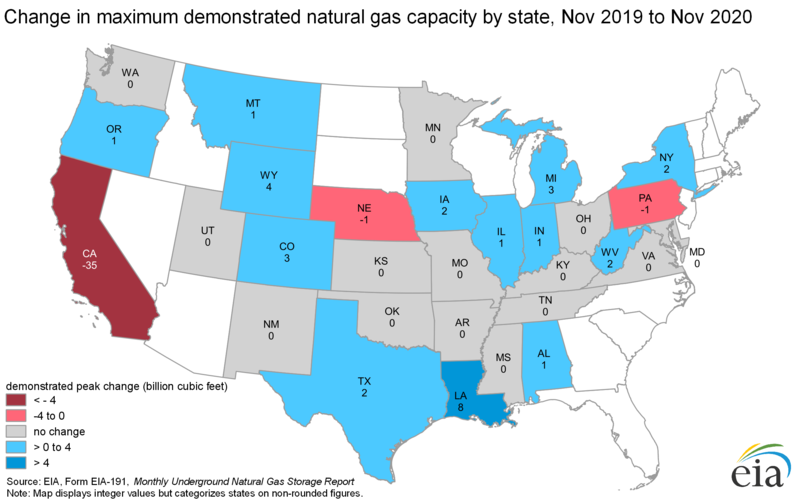 No new underground storage facilities; a few newly inactive fields: For the fifth consecutive year, no new natural gas storage facilities began operating in 2018. Any increases in working gas design capacity for the period came entirely from expansions of existing facilities and reclassifications of base gas to working gas. (A reclassification occurs when a facility determines that it can operate safely and comply with regulations at a different volume of base gas, often as a result of an engineering study.) In addition, two facilities became inactive in 2018: the Chevron Phillips Clemens field in Texas and the Oneok Osage/Burgess field in Oklahoma. These two facilities accounted for about 2.6 Bcf of design capacity. EIA considers a storage field inactive when its working gas has been depleted and the respondent confirms that the field will not be used in the coming calendar year and/or will be decommissioned or plugged. The East Cheyenne/Lewis Creek facility is also no longer listed as an active storage facility because its volumes are now included in the West Peetz/Lewis Creek combined facility. Note: Design capacity information for all underground storage facilities, including inactive fields, is available in the Natural Gas Annual Respondent Query System. Totals and calculations may not equal the sum of the components because of independent rounding. Information about storage regions is available at Storage Basics. Mentions of specific companies in this report include only information that is publicly available on EIA’s website or on the Federal Energy Regulatory Commission (FERC) dockets. R indicates that figures have been revised since the previous year’s Peak Capacity Report. (1) Demonstrated peak capacity, otherwise known as the maximum demonstrated working gas volume, is the sum of the highest storage inventory levels of working gas observed in each distinct storage reservoir during the previous five-year period as reported by the operator on the Form EIA-191, Monthly Underground Natural Gas Storage Report. The timing of the peaks for different facilities do not need to coincide. Inactive fields were removed from aggregate statistics. (2) Design capacity is an estimate of a natural gas facility's physical working gas capacity as reported by the operator on the Form EIA-191, Monthly Underground Natural Gas Storage Report. It represents the sum of all fields' capacities at a point in time. It is a measure based on the physical characteristics of the reservoir, installed equipment, and operating procedures particular to the site that is often certified by federal or state regulators. Inactive fields were removed from aggregate statistics. (3) Demonstrated peak capacity in some cases exceeds 100% of design capacity because design capacity limits may differ from actual capacity limits in storage fields, as determined by the facility operator and local regulations. (4) The design capacity of Southern California Gas Company’s Aliso Canyon field was included in this report and in the Pacific region totals at 86.2 Bcf, as publicly reported on Form EIA-191. The true working gas capacity of this facility may be lower because of ongoing operational constraints. Note:: Design capacity information for all facilities, including inactive fields, is available in the Natural Gas Annual Respondent Query System. Totals and calculations may not equal the sum of the components because of independent rounding. Information about storage regions is available at Storage Basics. Mentions of specific companies in this report include only information that is publicly available in EIA’s query system. (3) Peak capacity in some cases exceeds 100% of design capacity because design capacity limits may differ from actual capacity limits in storage fields, as determined by the facility operator and local regulations. Demonstrated maximum working gas volume more commonly exceeds design capacity in states with a smaller number of facilities and smaller total storage volumes. Design capacity decreases concentrated in states in the South Central region: Looking at state-level data, the two largest decreases in design capacity occurred in the South Central region. Design capacity fell by the largest share in Louisiana, where it fell by 2%, or 8 Bcf, because the Egan Storage Dome’s capacity was reduced in mid-2018. Design capacity in Texas fell by the second-largest share, 1%, or 4 Bcf, because Tres Palacio’s capacity was reduced at the beginning of 2018. Colorado saw the largest increase in actual design capacity of 4 Bcf, or 5% of the state total, because of the reclassification of base gas to working gas at the East Cheyenne facility. No states had significant increases in demonstrated peak capacity: Nationally, demonstrated peak capacity fell by more than 1% between 2017 (from December 2012 through November 2017) and 2018 (from December 2013 through November 2018), but several states saw large volumetric and percentage decreases, particularly Montana and California. Montana has one or more large facilities that operate at low utilization rates compared with their design capacity. Because the previous high inventory levels observed at Montana facilities were reached before December 2013, those earlier highs rolled off of the years used to determine the 2018 demonstrated peak period. Demonstrated peak capacity fell by a total of 10 Bcf, or 24%, in Montana. California has been facing structural and regulatory constraints on storage usage following the 2015 leak at the Aliso Canyon storage facility, and the state’s demonstrated peak capacity fell by 10 Bcf, or 3%, in the state. No states showed significant volumetric increases in demonstrated peak capacity in 2018 relative to 2017.